Just waiting to get my big pay check! Been working extra and nightshifts which means i got a pretty big budget to spend. Went in to the Local Guitar store here in Gothenburg, Sweden and tried out an Eric Clapton Martin signature model. I just fell in love with it. It cost around 3000USD tho, so im still thinking. First of all i Like the 000 Body which the OM John Mayer signature got as well. Ive read great stuff about the OM21, but im wondering if there is anyhing that would kind of compare to these guitars in the japanese way. I know that you hardly cant exakt copy a guitars sound because of the production steps, but is there anything out there that you would argument for? My budget is around 1500k. It might be hard to find, but there is a good option called the Sigma SEC42. Fancy triple O style guitar made in Japan under license from Martin should be well within your budget. There are also plenty of strange MIJ acoustic brands that I know nothing about like Triple S (Suzuki? ), Mountain, Haywagon, Blue Bell. Some of them made nice looking guitars. There's a fair bit of evidence that the older (ie Japanese) Sigmas were made by Tokai. Have one of their dreads myself and it's a seriously good guitar. You won't find one new, though. Martin pulled them a few years back. Have heard good things about Tokai's current acoustics ? the Cat's Eyes ? but haven't played any. The T is probably fairly close to what you're looking for. If they're available in Sweden, you might want to consider Ayers. They're made in Vietnam, supposedly under the supervision of some very, very good luthiers. If you get to play one you'll believe it. They're astonishing guitars for the money, but again, the only ones I've seen/played were dreads. Strangely enough, the last time I played an Ayers I played the signature model you mention in the same shop, and there's no way that I'd have considered the Martin after playing the Ayers, even if they'd taken the tasteless old jerk's name off it and halved the price. 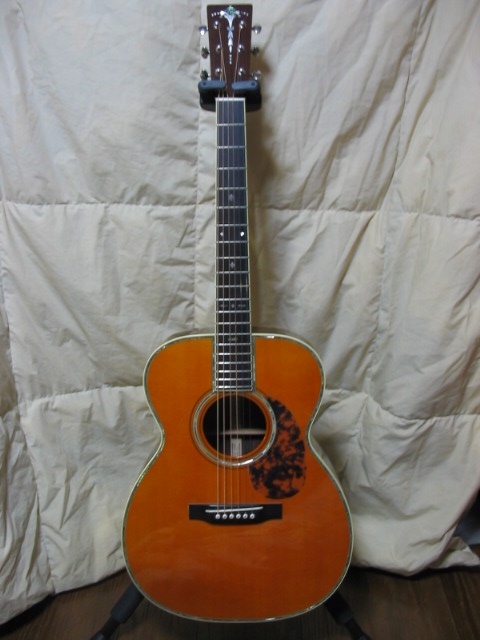 That said, the Martin was the better guitar (though not by a huge amount, and of a very different type). Its resale value would hold up much better, of course. If you ever go back to looking at American acoustics, try to play a Goodall at some point. The entry level Aloha models aren't all that cheap, but they are extraordinary. http://reviews.harmony-central.com/reviews/Acoustic+Guitar/product/Guild/GAD-30R/10/1 http://www.guildguitars.com/instruments/search.php?partno=3810300837 This is the best hands down value for money best sounding all solid wood OM on the planet right now.The price is an absolute steal .Don`t let the brand name or the place of manufacture put you off.Gabe. The price is an absolute steal .Don`t let the brand name or the place of manufacture put you off.Gabe. I paid ?550 for mine with a built in Fishman and a tweed case,that was a couple of years ago from Merchant City Music U.K. Gabe. http://www.youtube.com/watch?v=DEz_pGiErFo Here`s some particularily nice playing on the Guild 30r,it`s not me I might add! Gabe. http://www.richtonemusic.co.uk/products/guild_gad-30r_electric_acoustic_guitar_natural.asp Our friends at Richtone have got one in stock at a good price.Gabe.